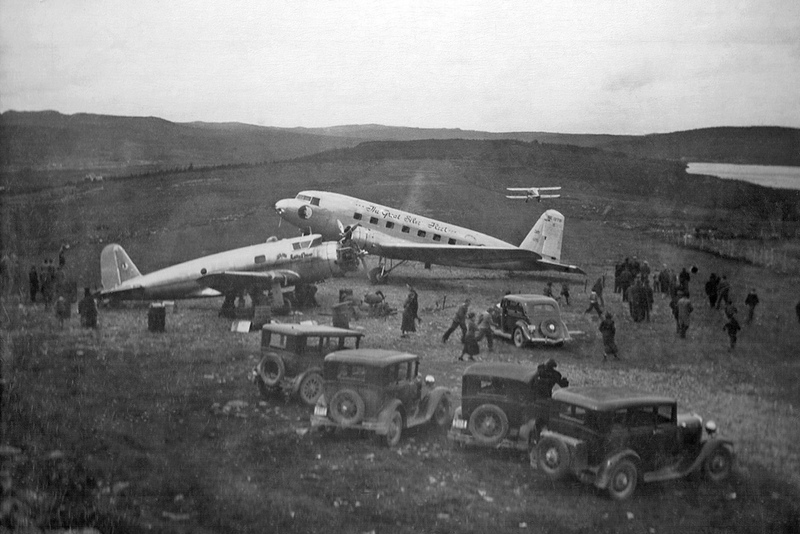 The DC-2-112 was one of 200 built by the Douglas Aircraft Co at Santa Monica in 1934. It was designated as serial no 1286 and delivered to Eastern Air Lines, New York as NC13736. Eastern Air Lines was a composite of assorted air travel corporations, including Florida Airways and Pitcairn Aviation, the latter established on April 19, 1926, by Harold Frederick Pitcairn, son of Pittsburgh Plate Glass founder John Pitcairn, Jr. In the late 1920s, Pitcairn Aviation won a contract to fly mail between New York City, Atlanta and Georgia on Mailwing single-engine aircraft. In 1929, Clement Keys, the owner of North American Aviation, purchased Pitcairn. In 1930, Keys changed the company's name to Eastern Air Transport, soon to be known as Eastern Air Lines after being purchased by General Motors and experiencing a change in leadership after the Airmail Act of 1934. In 1938 World War I flying ace Eddie Rickenbacker bought Eastern Air Lines from General Motors. The complex deal was concluded when Rickenbacker presented Alfred P. Sloan with a certified check for $3.5 million. Eastern Airlines became one of America’s most successful airlines. It ceased operations in 1991. NC-13736 served as a passenger aircraft until it was purchased in 1941, along with ten other remaining DC-2s, by the British Purchasing Commission in the USA, on behalf of the Australian Government as there was a desperate need for large capacity transport aircraft by the Royal Australian Air Force. In 1941 the aircraft was brought on RAAF charge as A30-11. It had been disassembled by Eastern Air Lines for shipping and was reassembled at Laverton No.1 Aircraft Depot in Victoria. The DC-2 saw RAAF service with No.1 Service Flying Training School, No.1 Wireless Air Gunners School and as a transport vehicle. It crashed in 1945 at Parafield, SA during a forced landing. See the full RAAF history of A30-11 here. In October 1946, the airframe was sold to Sid Marshall of Marshall Airways, Mascot, NSW and put into storage. The dismantled aircraft was was sold to the West Albury Rotary Club in 1979.